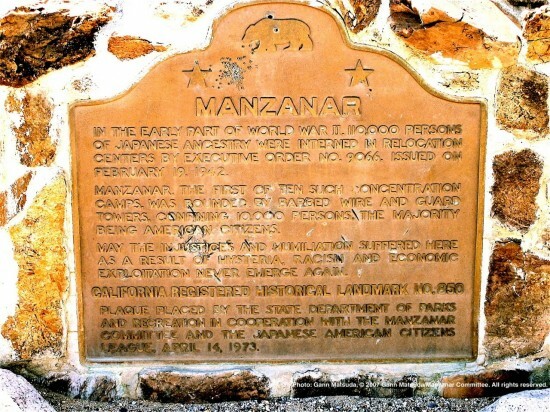 The plaque designating Manzanar as a California Historical Landmark was placed in 1973. After much debate, the wording included both “relocation centers” and “concentration camps” to describe the wartime incarceration of Japanese Americans. Editor’s note: In recent weeks, there has been a great deal of online discussion about the JACL’s “Power of Words” handbook. The Manzanar Committee, the Tule Lake Committee, and other organizations and individuals, including JACL members, were concerned that the handbook might be changed to accommodate those uncomfortable with the term “concentration camp.” During its quarterly meeting on Feb. 23 in San Francisco, the JACL National Board reaffirmed its support of the handbook as written, and the organization said on March 5 that no changes were ever planned. Following are statements from both sides. On Feb. 21, the Los Angeles-based Manzanar Committee reiterated its ongoing support for the use of accurate, non-euphemistic terms to describe the unjust incarceration of over 110,000 Americans of Japanese ancestry during World War II. “We believe that the injustices the Japanese American community had to endure during World War II should not be obscured by the use of euphemisms,” said Manzanar Committee Co-Chair Bruce Embrey. “Failing to be historically accurate undermines our effectiveness, and prevents us from achieving our objectives. These concerns stem from remarks made by JACL Executive Director Priscilla Ouchida on Feb. 4, 2013, that were published in “A Fork in the Road” on the JACL executive director’s blog. In her blog post, Ouchida indicated, in rather strong, blunt fashion, that the term “American concentration camp” could be rejected by the JACL in favor of other terms, because they fear opposition by other civil rights organizations, in particular, those representing the Jewish community. “In the early part of World War II, 110,000 persons of Japanese ancestry were interned in relocation centers by Executive Order 9066, issued on February 19, 1942. “Manzanar, the first of ten such concentration camps, was bounded by barbed wire and guard towers, confining 10,000 persons, the majority being American citizens. During the past several weeks, the Japanese American Citizens League has received numerous questions and comments from members and external partners within the Japanese American community about the organization’s position and plans regarding implementation of the Power of Words Handbook. JACL remains committed to fully implementing the Power of Words resolution and terminology handbook, as approved by the National Council, without removal of any terminology or edits to their recommended use. While some internal briefings and opinions on our website have circulated and raised concerns in the community, no proposal or resolution to remove or redefine terminology has been developed or brought before the JACL National Board for consideration. At the last JACL National Board Meeting in February 2013, the board reaffirmed its support for the Power of Words handbook and implementation as approved at the 2012 National Convention. JACL staff has been engaging in conversations with its partners outside of the Japanese American community to listen to their feedback and explore partnership opportunities that may help the handbook receive broader support and visibility. Some groups have indicated that their constituents may have difficulty supporting a term in the handbook, but acknowledged the Japanese American community’s right to define its own experience. No official partnership or coalition currently exists. Moreover, JACL will not recommend or propose the removal of or edits to the terminology handbook as a condition of participation in a broader coalition. JACL, its leadership, staff and individual committees have been actively promoting and distributing the handbook to elected officials, members of Congress, federal agencies and organizations, without reservation. As part of the implementation strategy, the Education Committee of JACL has also been developing a broader outreach and distribution plan for the Power of Words handbook.